Okay, you have chops. You can ride a bike and climb a mountain. You know things. But you don’t know what the South’s best professional guides know. You don’t know where the secret fields of blueberries are. Where to best anchor that waterfall rappel. Where to find an unlimited stash of backcountry singletrack. 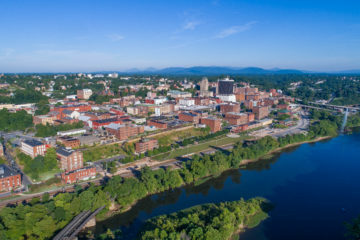 If you want the biggest adventures the Southern Appalachians have to offer, sometimes it’s best to go with a pro. Here are six of the best guided trips in the South. 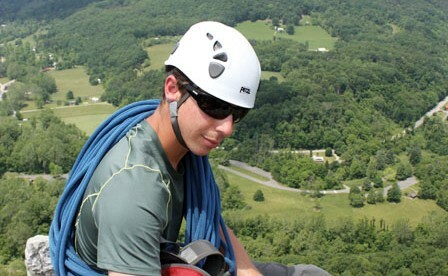 Ron Funderburke, head guide for Fox, didn’t discover a love for climbing until studying abroad in France during college. He hooked up with climbing roommates and the rest is history. “I knew I wanted to work in climbing, and started down that path,” Funderburke says. The path eventually led him to Fox, where he leads multi-pitch trad climbs throughout the South and ice climbing in New England. Drop into the 2,000-foot deep, 12-mile long Linville Gorge for a full eight-hour day packed with four miles of steep, rugged wilderness hiking between three big multi-pitch climbs and a grand total of 1,500 vertical feet of rock climbing. Because time is money. Hiring a pro is a no brainer for climbing rock, but Funderburke and his colleagues earn their pay on this trip during the bushwhack to the bottom of the crag. “You’re crawling down lots of boulders, falling over trees and briars. It’s easy to be skeptical and start second guessing yourself,” Funderburke says. 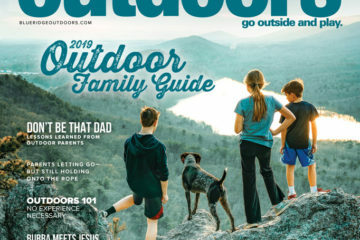 Andy Nichols, owner and lead guide of Shenandoah Mountain Guides, grew up next to Shenandoah National Park exploring the backcountry from an early age. “When there are no stop lights, no McDonalds in your county, all you have to do is hike, canoe, and ski,” he says. 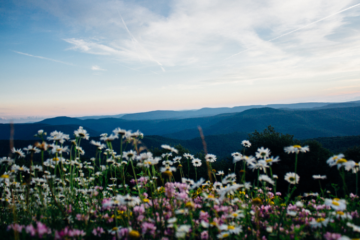 After an extended stint in the Navy as an officer and then a corporate career, Nichols decided it was time to pursue his passion, and founded Shenandoah Mountain Guides, 20 years ago. He’s helped set the standard for guiding in the Southern Appalachians in the process. Nichols puts you at the top of Red Creek inside the 17,371-acre Dolly Sods Wilderness, a unique high-elevation plateau known for its Canadian-esque bogs, then leads you down the belly of the river for two days of rappelling down waterfalls, jumping from ledges, and swimming in deep pools. “This is as good as it gets,” Nichols says. 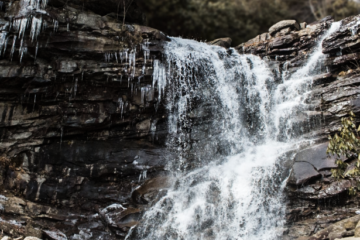 “If there was ever a trademark activity for the Southern Appalachians, cascading would be it.” The two-day trip is only six miles long, but it takes time because the terrain is so treacherous. You camp by the river and take a side trip to cliff-top views, and have plenty of time to explore the coal seams behind the waterfalls. Nichols likes to run the trip in August, when the water is low and the river is more navigable and the blueberries are in abundance in the Sods. 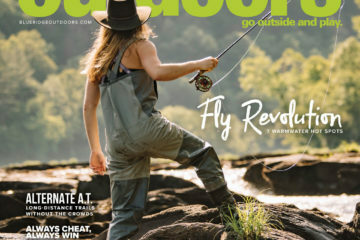 Pura Vida Adventures pioneered canyoneering in North Carolina, and running clients through the belly of Big Bradley Canyon in the Green River Gamelands has become Moerschbacher’s signature trip. It’s a full eight-hour day of wet waterfall rappels and boulder hopping. The trip starts with a 45-foot rappel to the top of Big Bradley Falls, then a 70-foot rappel down the edge of the waterfall into the canyon floor. After a lifeline traverse beneath the waterfall, you’re set for hours of boulder hopping and swimming with two more smaller rappels mixed in for good measure. Exit the canyon via a 20-foot rock climb to cap off the day. Seneca Rocks Climbing School, W.Va.
Because guides teach. 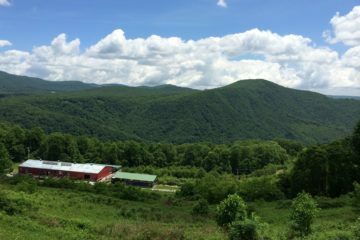 Seneca Rocks Climbing School is a full-service teaching facility with programs designed to impart lasting wisdom to would-be climbers. A climb with Teel is an opportunity to learn. He gets a bigger kick out of teaching someone how to place trad gear in a cranny than he does leading you to the top of a mountain. 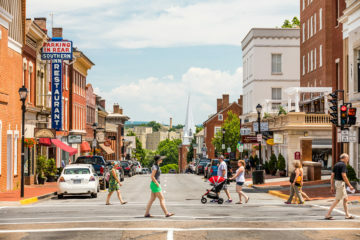 Chris Scott, owner of Shenandoah Mountain Touring, grew up outside of D.C. riding bikes in Virginia and West Virginia. “We had such an enlightening national forest experience out here, but no one was taking advantage of it,” Scott says, discussing his decision to start Shenandoah Mountain Touring and the Shenandoah Mountain 100 fifteen years ago. “The signage was horrible and the trails were in bad shape. We wanted to share it with people. We created the Shenandoah 100 because it was the most amazing trail you could ride in a single day.” And he created the guide service to keep that stoke going year round. Picture three days riding roughly 150 miles of singletrack over eight mountains deep in the George Washington National Forest backcountry, traveling from Stokesville to Douthat State Park and back to Stokesville. 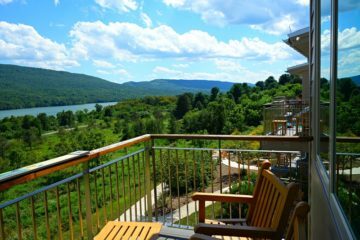 Bikers get to pedal a choice piece of the legendary Shenandoah Mountain Trail, climb to views from Elliott’s Knob, and roll along the Chimney Hollow Trail, a ridgeline path in the Crawford Mountain Roadless Area that’s more fun than Mr. Toads Wild Ride. You need to be fit to pedal with a pack over 50 miles a day, but Scott calls it a “customizable Western Spirit style tour.” A shuttle van runs you from the end of the trail each day to the digs at Douthat State Park, and if you’re not up for the challenge one day, you can opt out. Even better, the whole thing is catered and includes Scott’s famous home-baked bread. Plus, Scott and his crew put in 300 hours clearing those trails before the season starts in May, so the singletrack is pristine, an anomaly for backcountry trails in the Southern Appalachians. Because they think of everything so all you have to think about is riding. Shenandoah Mountain Touring runs the support you need to keep your pack weight minimal. Do this sort of thing without the van and the cooks, and you’re looking at hauling 30+ pounds over 150 miles. 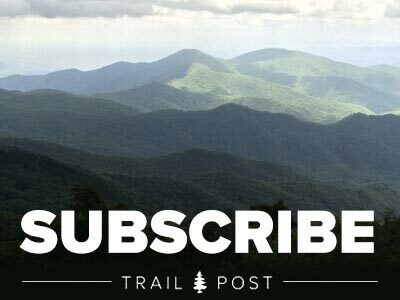 Pisgah Ranger District of Pisgah National Forest is literally a maze of singletrack and forest roads that have become ground zero for adventurous mountain biking in the South. The trails are remote and littered with roots, rocks and blowdowns. The climbs are frequent, long, and often frustratingly technical. The gravel road connectors are plenty. But the payoff is big with sinuous singletrack, bomber descents, and big views. 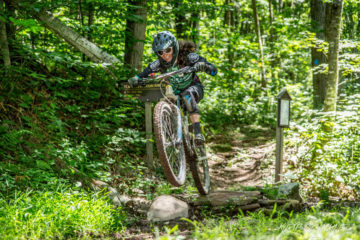 The Bike Farm’s big ride will take you on a 30+ mile day that hits big-name trails like Squirrel Gap, Laurel Mountain, and Pilot Mountain (think half-track on the side of a slope, followed by boulder-hopping downhills). “It’s tons of technical trail, a few fire roads, and a big finish with a dive into a swimming hole,” Smith says. Then of course, you have the obligatory trip to Oskar Blues in downtown Brevard. 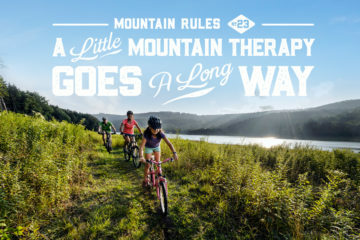 If one day isn’t enough carnage for you, tack on a second day for an adventurous ride on the entire Black Mountain Trail, which will likely inspire every single emotion you can have on a bicycle, from hate to love, as you oscillate between hike-a-bike sections and big, sweeping downhills. Because the guide knows the line. Riding Pisgah with The Bike Farm is like riding with a local on his backyard trails. Smith and Surls know which direction to hit the trails, which lines to take down the mountain, when to hit the brakes, and when to let it out. 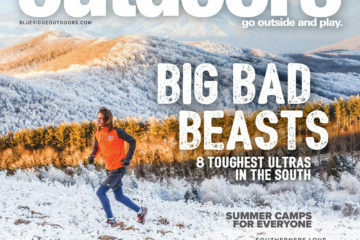 “There are benefits to following someone who’s a local with intimate trail knowledge. It’s a different ride,” Smith says.